The Leeds Mercury, Monday, September 30, 1867. At the invitation of Colonel Gascoigne, who had made an express journey from his shooting-box in Scotland for the occasion, the First West Riding or Leeds Volunteer Artillery had, on Saturday, a field day on his finely-wooded estate at Parlington. The corps, which mustered nearly 350 strong, paraded in the Coloured Cloth Hall-yard, whence they marched to the Marsh-lane station of the; North-Eastern Railway, the managers of which had provided a special train for their conveyance to Garforth. The brigade left Leeds under the command of Major Butler, the following officers being also present; Surgeon Hayward, Adjutant Shields, Capt. Jackson, Capt. Oates, Capt. Harding, Capt. H. W. Butler, Lieut. Turner, Lieut. J. T. Butler, Lieut. T. S. Butler, Lieut. Hirst, and Lieut. Appleyard. On arriving at Garforth, where the parapet of the bridge overlooking the station was fringed with spectators, they were formed into line of march, and, headed by the fine band which, under the leadership of Mr. Tidswell, played a selection of military music, they proceeded along a tramway, picturesquely skirted with woodland, and forming a lengthy avenue of considerable beauty, to one of the entrances to the park, where they for a short time dispersed. At the sound of the bugle the brigade again formed into line to receive Colonel Gascoigne, who appeared mounted in his uniform as the chief officer of the corps, and bade them welcome. They were then marched to the gentle acclivity immediately in front of the hall, from which they were only separated by the sunken tram-road running between the colonel's collieries at Aberford and Garforth, and this extensive meadowland which is richly studded with many a noble oak and elm with their ponderous gnarled and knotted branches, formed their base of operation for the remainder of the day. Thither they were followed by a group of onlookers, amongst whom were several ladies, who by the kindness of the owner of the demesne were permitted to participate in the pleasure of the spectacle. A strong wind, which occasionally blew in very violent gusts across the park, added to the very threatening aspect of the clouds overhead, from which a by no means agreeable down-pour seemed imminent, had however, the effect of somewhat marring the enjoyment of the proceedings. 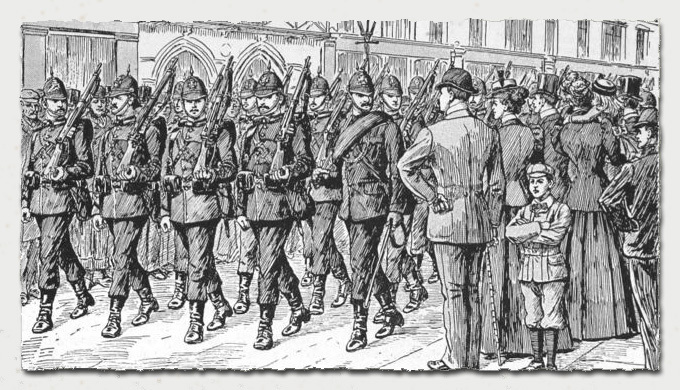 As soon as the marching column arrived in front of the hall it was opened to the front, and Colonel Gascoigne, in addition to whom, it may here be stated, Major Butler and Adjutant Shields were mounted, put the corps through a variety of field manoeuvres, which tested the efficiency of their drill instructors, and which, notwithstanding the presence of numerous recruits, wore executed with a precision and steadiness fully equal to that which they displayed when the eyes of the inspecting officer were upon them at Leeds a few weeks ago. The eight companies into which the brigade were divided looked especially well as they formed squares for the reception of cavalry, with their carbines flashing and the reports ringing, around the glades as the imaginary hostile troopers rode on. This manoeuvre being completed the whole brigade were formed into a line in the rear of six iron and two brass carronades and one mortar, belonging to Colonel Gascoigne, who had placed them as in a battery in a position which gave a command over the hall. The requisite number of gunners were selected from each company, and these having taken up their respective posts, the remainder of the brigade were told off into two divisions which flanked the battery. The enemy was supposed to be entrenched in the hall, and under the command of Major Butler a vigorous fire was opened upon him, a liberal supply of ammunition having been served out for this purpose before leaving Leeds. The guns were served with readiness and energy, and they were well supported by the two divisions, who kept up a sharp and constant fusillade with their carbines. The superiority of the volunteer marksmen told on the imaginary foe, and the battery was advanced a few paces, when the gunners and their supports resumed their firing with an equally effective result. The spectators were loud in their admiration of the scene as the cannon blazed forth amid the thick volumes of battery smoke, and volleyed and thundered around the hills and dales of the park, This portion of the afternoon's programme must have been especially beneficial to Site corps in assisting them to realise in a practical manner, and in a way superior to all theoretical instruction, the nature of the duties they would be called upon to perform as artillerists in actual warfare. After a few more evolutions had been executed the brigade piled arms, and while the rank and file were served with substantial refreshments in a covered building in the park, Major Butler and the officers were entertained by Colonel Gascoigne in the hall, during the performances of the band on the lawn in front. The corps then returned to Leeds by special train.